It isn’t as easy as just planting the fields as farmers know well . Here pictured are the plants just 5 days old. 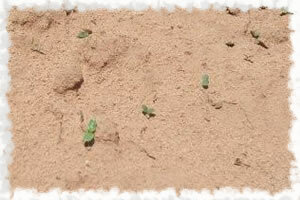 And there are a million sesame plants growing! As soon as this ripens, I will cut it and transport it to all 5 fields and then have it stacked around all the dove stands. Oh, yes, and talking about stands or blinds, this will also be the first year: each hunter and bird boy will have his OWN dove blind 100 or more yards away from the next shooter, so there is no worry about having someone else shooting at you from close by. 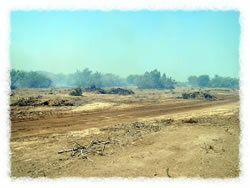 Again, this is the only place in all of Mexico that will incorporate this new practice of dove hunting. You will have all the freedom you need to take all the shots you want without worrying about hitting your fellow hunter–or getting hit!! 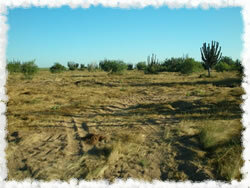 Another first from Camp David -N- Mexico where the best is expected each and every hunt. 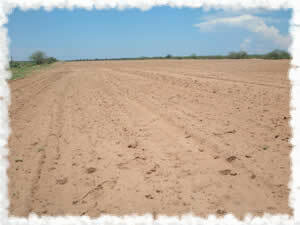 I have been working like crazy getting all the dove fields I own ready to shoot. 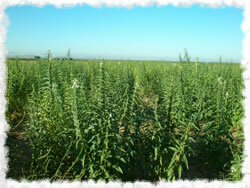 This shows one of them right next to my field of sesame .This 2009-2010 season will be one of VERY BEST on record because of the double hatch out on Dove. 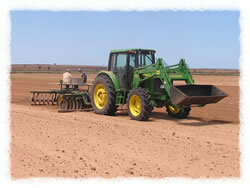 Shown above is the planting of a hundred acres of Sesame that will be used just for dove hunting. Sesame is one the very best foods for attacking dove. This will be cut then placed around “YOUR” private dove blind. 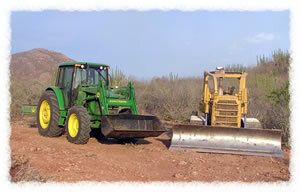 The making a another dove field that is placed close by a roosting place used by dove for many years, located way back in a private canyon where you always hunt alone. As you can see, there is no expense cut here at Camp David only the best for my hunting clients. This new field is only 20 minutes away from the lodge . You always return to the hunting lodge after each hunt for some of the best food you have ever tasted. The making of a another dove field. Dove fields are not always were you want them to be. Doves have their own habitat that they like. You have to be able to buy the land close by these habitats and then develop a hunting field, which costs lots of money, but assures my clients of the best possible dove hunts.